It was the first time that I did not have anyone playing in the Monday night game to save me, but that wasn't the thing that cost me the game. I decided to play the match-up game and start Andy Dalton over Derek Carr, that hurt and it didn't help with the result but it did not cost me the game. 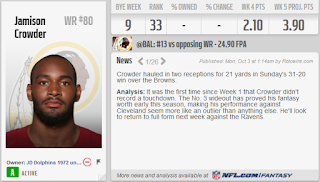 My decision to pick up Jamison Crowder and start him in the flex position instead of Michael Crabtree, that is what cost me the game. I should have stuck to my guns, just last week I was praising Crabtree for being "The Guy" for the flex position, guaranteeing 10 points a week. I should have kept him in the team but instead I decided to try and be clever and pick up someone under the radar as a Free Agent. Crowder should have done better against Cleveland, but at least he can walk away with some sense of pride. 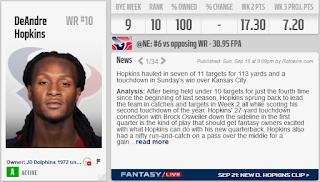 He's only a WR3, a slot receiver, but he far exceeded any performance from my WR1 DeAndre Hopkins. Right now Hopkins owes all of his fantasy owners for two sub-par weeks. He has been awful, but more about that later. 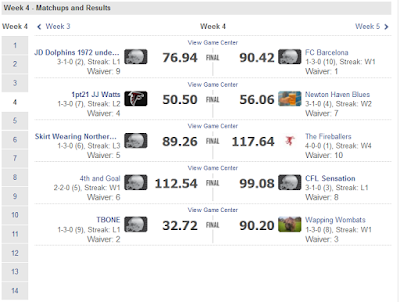 Well that was probably the worst output I have seen from any set of fantasy wide receivers this week. 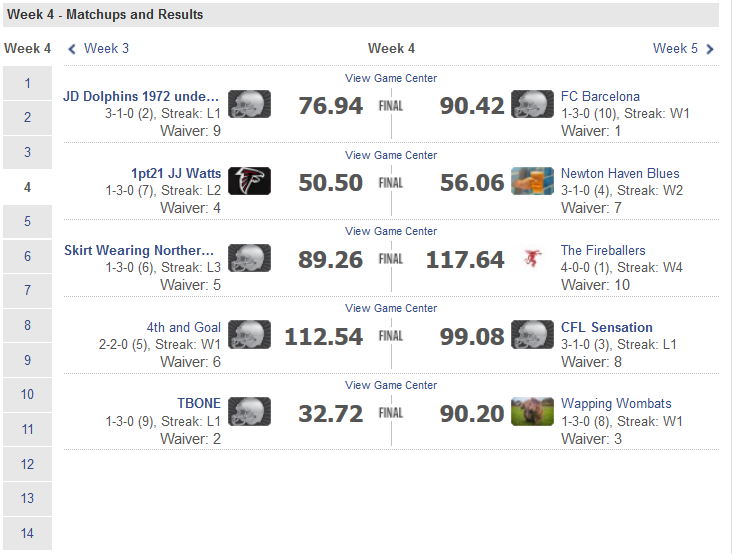 I could have left all 3 positions empty and been down less than 10 points. They were pathetic, and it was made even worse by the fact that each and every one of them had a favourable match-up on paper. 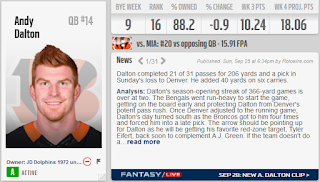 Andy bloody Dalton. Once again it wasn't an awful performance but it stung all the more because I sat Derek Carr who went and destroyed the Baltimore secondary. Redzone problems continue to plague the Bengals and I'm sure that they cannot wait to get Eifert back in the fold so that the can target someone, anyone, other than AJ Green (who burnt me for 23.30 points). 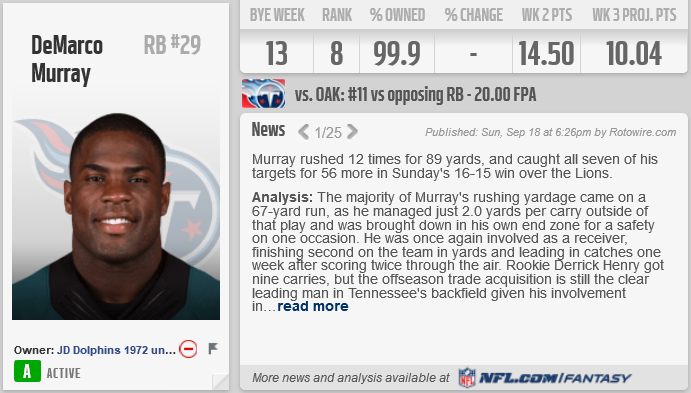 DeMarco Murray was simply amazing once again, and it is such a shame that his brilliant effort went to waste for my fantasy team. 3 consecutive weeks with 100+ yards from scrimmage, 5 TDs on the season, Miami, Cleveland, Indianapolis and Jacksonville up next. If he can stay fit then there should be a lot of fantasy points coming through from my RB1 position. Devonta Freeman also put in a decent performance with a TD, but seemed to tail off in the second half, but his twelve points were nothing to be sniffed at. This was a deficit too big to make up. Nuk has been awful down in Houston the past couple of weeks and Travis Benjamin has two fumbles and no TDs since emerging as WR1 in San Diego. 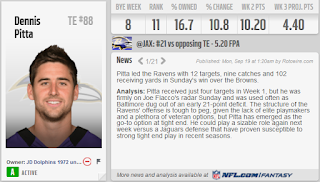 I would have been better off starting any other WR combination than these two in week 4. There is talk that they will bounce back in week 5, but it is hard to see how right now. 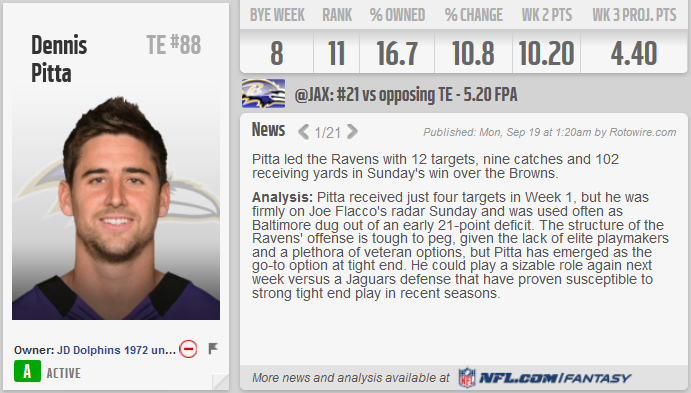 Another quiet week for Pitta, another week where it seems that I gave up on Barnidge too early. I won the match-up with my opponent but I really need more production from this slot, especially if my WRs continue to under perform. A poor week for Cairo who is on a bye next week, but the same can be said for each and every member of the Chiefs team. They were embarrassed by a Pittsburgh team looking to bounce back after their own embarrassment at the hands of Philly. Cairo is still a decent fantasy kicker despite missing his first FG of the season from 49 yards and will likely be my starter again in week 6 once he gets the bye out of the way. The LA Defence are keeping their team in games week in, week out right now. giving up an average of 14 points a week after the 28-0 shutout in San Francisco the only time anyone has really put the hurt on them was when Jameis Winston decided to just fling the ball about everywhere in week 3, and they still found a way to help their team win. 4 INTs in the last two weeks, 5 fumble recoveries on the season, seven sacks and one TD scored... This is the LA Defence I was expecting to see at the start of the season. Next up is a Buffalo team that beat the Patriots in Foxborough but only scored 16 points. Rex Ryan is a defensive whizz but he will need to come up with something pretty special on the other side of the ball if he wants to score on this LA team. This is where it all went wrong. Everyone on my bench who played in week 4 could have conceivably improved my team. The two standout performers were Oakland's Derek Carr and Michael Crabtree. They may have done enough this week to convince me to stop playing silly games and just start them every week except their bye week. Alshon Jeffery is still without a TD this year but he gained enough yards to be my WR2 and Theo Riddick would have been a better Flex choice than Crowder. 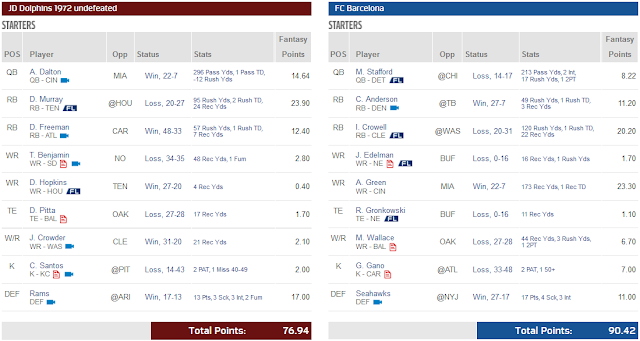 Surprisingly my bench was not the highest scoring this week, with The Fireballers putting up 72.60 points, and somehow they still managed to win their game. 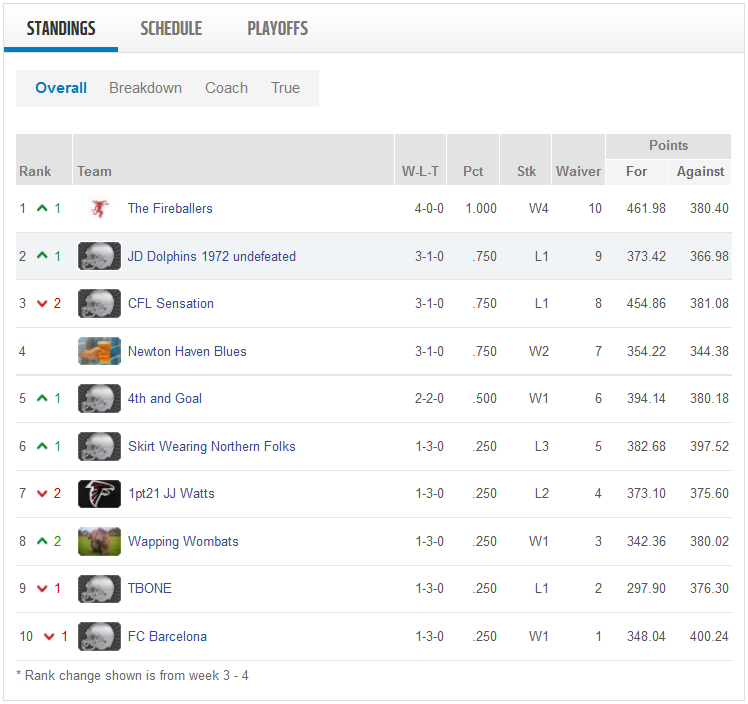 There is only one undefeated team left in play after week 4, The Fireballers and they will be facing the Newton Haven Blues who are on a two game winning streak and holding on to fourth in the table. Despite losing the Dolphins climb up one spot to second with a game against the Wapping Wombats in week 5. Even I am not sure how this works. 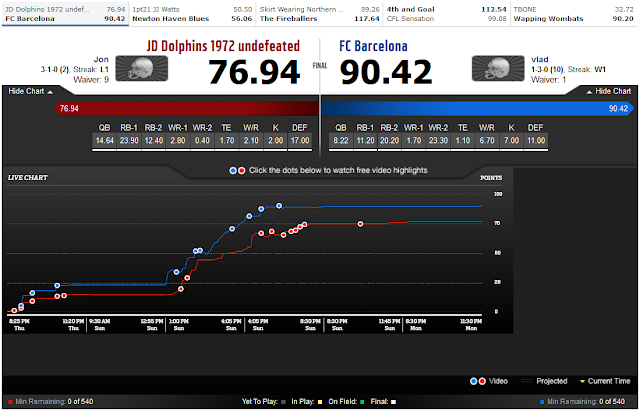 Every team in the league now has at least one victory and FC Barcelona will be looking to get some momentum going off of the back of this week as they take on the 1pt21 JJ Watts. Skirt Wearing Northern Folks have a tough match-up against CFL Sensation if they want to end their league leading three game losing streak, while their opponents will be hoping to bounce back to the top of the table.